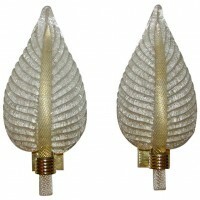 Beautiful pair of Murano glass wall sconces in leaf shape form, manufactured by Barovier & Toso in the early 1950s. Finely twisted glass stem infused with gold flecks and the reverse side of the leaf in the “Rugiadoso” technique with scattered fine particles of glass that diffuses light. Each glass leaf is suspended on brass backplates. Newly wired. Each sconce uses 1 – 40 watt max candalabra base bulb.